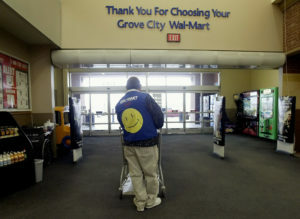 Walmart told greeters around the country last week that their positions were being eliminated in late April in favor of an expanded “customer host” role that involves not only welcoming customers, but helping with returns, checking receipts to help prevent shoplifting and keeping the front of the store clean. The position requires hosts to be able to lift heavy weights, climb ladders and do other tasks. Walmart has already started making job offers to the greeters. At least two longtime greeters — Adam Catlin in Selinsgrove, Pennsylvania, and Jay Melton in Marion, North Carolina, both of whom have cerebral palsy — have accepted jobs in self-checkout. Catlin’s mother, Holly Catlin, helped call public attention to her son’s plight with an impassioned Facebook post and she has since advocated for greeters around the country. After emailing Walmart CEO Doug McMillon every day, Catlin got a call from the corporate office on Thursday, and on Friday morning she and her son met with store management in Selinsgrove. In North Carolina, Jay Melton is “happier than a pig in a mud puddle,” said his father, Jim Melton.